Sonic’s menu consists of hamburgers and French fries, as well as onion rings, corn dogs, chili dogs and breakfast toaster sandwiches. Drink options include soft drinks, slushes, as well as milkshakes. Customers can combine various drinks and flavors to create thousands of possible drink combinations. And our favorite, Ice cream desserts including sundaes, and floats. 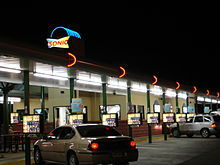 At Sonic Drive-In, drive into a covered drive-in stall, order through the intercom speaker system, and have food delivered by a carhop. A patio seating area, and drive-thru lanes is also available. For a full menu, click here to visit Sonic’s website.